The Doel Reed Center for the Arts remembers Jim Vallion, a true renaissance man who had a fire for life and a passion for the arts. Mr. Vallion was known as many things throughout his life: an OSU alumnus, legendary restauranteur and a successful entrepreneur, to name a few. To the Doel Reed Center for the Arts, he was a magnanimous influencer who led by doing. Mr. Vallion fervently supported the renovation of the Doel Reed Center, located in Taos, New Mexico, and was instrumental to the project’s ongoing success. When Ms. Barrett began driving her brother to Taos from Oklahoma City, she too grew a deep love for the Doel Reed Center for the Arts. They both physically worked to restore the property, helped raise money for improvements and invested in the vision of the Doel Reed Center for the Arts. In 2010, Mr. Vallion funded the Smelser Vallion Visiting Artist program, and well-known Western painter Sonya Terpening was the first to hold the prestigious position. Each year since then, visiting artists have created masterpieces while studying at the Doel Reed Center in the summer. They’d later share their knowledge during workshops and lectures in Stillwater, honoring OSU’s land-grant mission. "Jim Vallion was one of those rare souls whose enthusiasm and generosity could move an endeavor to unimaginable heights. 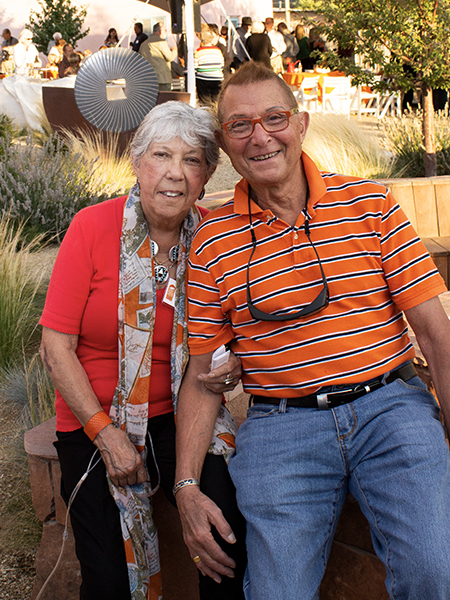 His deep personal commitment to the Doel Reed Center for the Arts - through his encouraging presence, endowed scholarships, the Smelser Vallion Visiting Artist fund, and multiple gifts to fill immediate needs - has greatly enriched the lives of students in Taos and in Stillwater. We all owe him a great debt of thanks. He will be much missed." In 2013, the Doel Reed Center celebrated the dedication of the Vallion Gathering Place, a courtyard that has become a central component to leisure learning courses each summer. Maggie’s Garden, named in honor of Ms. Barrett, was added to the property in 2014. “It’s such an honor to tell people about the Vallion Gathering Place and Maggie’s Garden, how it started and what it means to me. It meant the world to my brother." One of Mr. Vallion’s last gifts to the Taos, New Mexico, center was to help fund the creation of a ramada, an outdoor pavilion and gathering space. The idea for the feature came about after Megan Singleton, a visiting artist specializing in papermaking, had to continuously move her work to avoid afternoon rain showers. Once fully funded, the ramada will provide future visiting artists and students shelter from the weather and forever symbolize Mr. Vallion’s appreciation for art. Anyone wanting to honor Mr. Vallion is encouraged to contribute by calling Deb Engle at 405-385-5600 or emailing dengle@OSUgiving.com.